Grandmaster Kwan Kyun Kim, 8th Dan Black Belt, and Chief Instructor of Kim’s College of Tae Kwon Do in Richardson, Texas, directs and teaches Song Choe College Instructors in the true traditions, techniques, and philosophy of Chung Do Kwan Tae Kwon-Do. Before coming to America in 1978, Grandmaster Kim was chief instructor of the U.S. Army 2nd Infantry Division in Seoul, Korea and served as team instructor for the Korean R.O.K. Army Marine Corps demonstration team, and Korean special police forces in the martial art of Tae Kwon-Do. 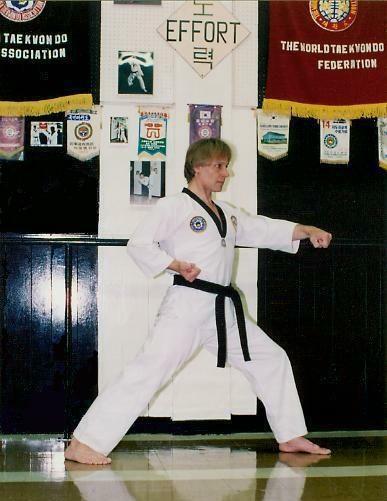 Australian born, Clifford Bird began martial art study at 17, and has over 38 years experience, with 17 years devoted to teaching. He holds a 2nd degree black belt in Oh Do Kwan Tae Kwon Do, and a 5th degree black belt in Chung Do Kwan Tae Kwon Do under Grandmaster Kwan Kyun Kim and The World Tae Kwon Do Federation. Master Cliff spent 7 years instructor training under Grandmaster Hwa Song Choe and the last 10 years instructor training under Grandmaster Kim.